Could ComfortClick's platform simplify the smart home? As technology advances and us consumers get lazier, the concept of the smart home is becoming more of an everyday reality, with automated devices beginning to proliferate through our households. The trend is creating an exciting marketplace but with multiple devices launching on multiple operating systems, the smart home is in danger of becoming fragmented, nullifying the convenience smart devices are supposed to bring. That's why ComfortClick has created an operating system designed to control all our different devices from one app and simplify the situation. We spoke to the company's CEO Luka Persic to find out more. TechRadar Pro: What is the current state of home automation? Luka Persic: The number of home devices is increasing almost exponentially. Lately we were able to see a lot of successful projects such as Nest and Philips Hue. However these devices are all operating independently. You have to get a separate app for each device, meaning different user experience each time. Now imagine the future, if this trend continues – you'll have to switch between 20 or even 50 different apps in order to control your home . TRP: What is ComfortClick bOS? LP: ComfortClick bOS is the first building operating system, it's a universal software platform that enables the integration of different home devices and their control via a single app on users mobile device which can be iOS, Android or Windows based. ComfortClick bOS features also plugins market – ComfortClick Bridge, where users will be able to get plugins for their home devices. The library already features an array of supported devices and protocols such as KNX, Modbus, S BUS, XBMC, DSC, IP cameras, Global Caché, IRTrans,…We just launched Indiegogo campaign - ComfortClick bOS the first building operating system. 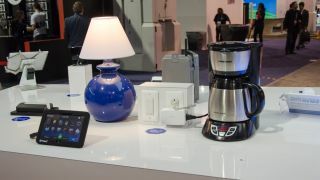 TRP: What is different about bOS in comparison to other home automation solutions? LP: We would like to give our users the possibility to connect, monitor and control any device, from any manufacturer via a single app. Users will be able to control just one device e.g. room thermostat or all devices at home. So, the basic solutions will be affordable for everybody and you'll be able to upgrade whenever you want. TRP: What are some practical usage examples? LP: One universal platform where all devices are working together offers practically limitless number of different features. Some of the more interesting ones are logical operations - for instance, when you leave home ComfortClick bOS will turn off the lights, lower the shades, reduce the heating, turn off electrical sockets and activate presence simulation. Another interesting feature is electricity consumption monitoring and automatic alerts if your electricity consumptions exceeds preset thresholds. With logical operations and energy consumption monitoring you can cut your energy bills by around 30%. TRP: Will third party developers be able to participate? LP: We are aware one single company can never cover all the devices that are out there. We'll offer a playground for 3rd party developer community and give the developers a chance to earn money for their work by selling their plugins in ComfortClick Bridge. Anyone who knows a little bit about programming will be able to start developing plugins for ComfortClick bOS using the bOS software development kit (SDK). TRP: Is ComfortClick bOS intended only for residential buildings? LP: We don't want to limit only to residential buildings. Automation system offers numerous benefits also for commercial buildings such as office buildings, hotels and hospitals. Imagine coming into a hotel, you already have ComfortClick bOS on your phone, by entering hotel's ComfortClick bOS username and password you'll be able to control your room. TRP: How far along are you with your software platform? LP: We have a fully functional software platform. Together with our partners we have successfully used our software in projects all over the globe. ComfortClick is present in EU, Russia, Qatar, Kazakhstan, India, Thailand, Malaysia, USA and Latin America. With ComfortClick bOS we want to take a step forward. TRP: Apple has announced its smart home solution. What does this mean for other players? LP: Home automation is already struggling with too many communication protocols. Apple just announced another one. It's going to take a really, really long time - if ever - before we'll have a standard communication protocol for all home devices and systems. The solution is universal software platform and that's exactly what bOS aims to be.